If you are like the Sweet Pea family, you *know* salmon is a great thing to eat, but perhaps you just don't find yourself eating it that often. Wild Salmon is in season now, so find some Sockeye or other Pacific Salmon in your local stores. 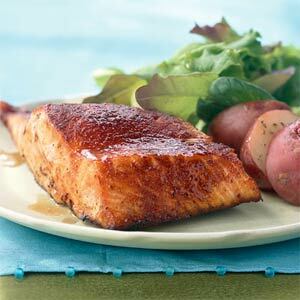 For Mama In Training who requested more fish recipes, this one is for you! We adapted this from a Cooking Light recipe. SPH uses a cedar plank, soaked for about 30 minutes in water, and places it right on top of the grill. If you don't have a cedar plank or don't care to use one, you can use a fish basket for the grill, or broil it on the oven at about 425 degrees. By the way, if you do invest in a cedar plank, they last for many years, as long as you soak them sufficiently before putting them on the grill. The maple syrup in this recipe makes it fun for the kiddos, but the flavors are spot on for adults too. Clean and pat the fish dry. Mix the rub and gently rub it on the salmon, but not on the skin side. In a preheated oven or grill (on high), cook the fish for about 6-7 minutes. You do not have to flip the fish. Once the fish is cooked, drizzle the maple syrup on top. Easy peasy! We serve this with our favorite Parmesan Grits and Bean Salad. Can't wait to try it. Mama in Training and I were just talking about needing more fish recipes today! Sounds delish...but salmon falls under the "things John doesn't like" category. And I love salmon. Gah. I think it's worse to have a picky eater as you husband because at least with kids there's a chance they'll grow out of it!